Celtic manager Ronny Deila is impressed with how his team have responded to European setbacks this season. The Parkhead side's winless Europa League campaign ended with a draw against Fenerbahce in Turkey, but they produced an excellent display to beat in-form St Johnstone at McDiarmid Park. 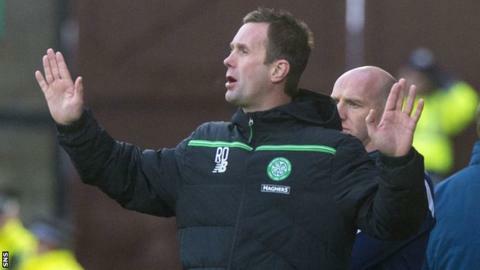 "I'm very, very happy," Deila said of the 3-0 victory in Perth. "Ten times we're coming back (from European matches) and 10 victories so you can't do it better than that." Deila said it was important for the Turkish striker's confidence to get back among the goals. "He played very well. It was good for him. There are a lot of these young boys who need confidence and have some good experiences, and today Nadir got two and it was very, very good for him," the Norwegian told BBC Scotland. The scoreline suggests a comfortable victory for the champions, but Saints had their moments. Michael O'Halloran passed up two great chances - including one in the opening minute when he was denied by Celtic goalkeeper Craig Gordon - and Brian Easton's powerful long-range drive crashed off the post. Deila was happy with the clinical nature of the champions' victory, but believes Gordon's contribution was just as important as that of Ciftci or the game's other standout performer Tom Rogic. "They had the chances," he admitted. "Craig Gordon was unbelievable today. Two times he had unbelievable saves. We have to humble for that and give him credit. "I think we defend much better now. They had a lot of crosses, set-plays. We were really aggressive and disciplined in the back four." St Johnstone manager Tommy Wright was left to rue the opportunities spurned by his men. "The performance was good, but we lacked that ruthlessness in front of goal, that clinical finish that would have given us a great opportunity to pick up three points," Wright said. "I thought we created enough opportunities to win the game. We didn't convert them. Good goalkeeping plays a part but I think we should do better in certain situations. "At the other end we give two goals away from set-plays which is disappointing. It does emphasise the point that you must take your chances."